« *** WINNERS *** Jennifer, Jenn, Benny and Wendy are Living the Life of Riley! CONGRATULATIONS! Winter is definitely one of my favorite seasons, for here in the South, it's the only time that we tend to get a break from the sweltering heat we experience most of the year. Unfortunately, I get cold very easily and so it is difficult for me to really enjoy the outdoors at times. I love to camp, fish and attend outdoor events of all kinds, so when the winter cold is at its worst, I find that a good hand warmer is essential in helping me to stay warm. I've used the chemical packs in the past, but was never very impressed with the heat they put off. Thankfully, I had the opportunity to review the Zippo Deluxe Hand Warmers to see if they could keep my fingers nice and toasty, even in the coldest weather. Keep reading to learn much more! I reviewed the Deluxe Hand Warmerfrom Zippo, which retails for $29.95, but is currently on sale for $22.95. Zippo is a brand that I associate with being the best. In my opinion, they only make extremely durable and top quality products, so I had great expectations for their hand warmers. The Zippo Hand Warmer is an efficient little heater which can slip easily into almost any size pocket in order to warm the hands and body on chilly days. I loved the smooth and sleek metal construction of the hand warmer as well as the convenient filler cup and fleece warming bag that were also included. 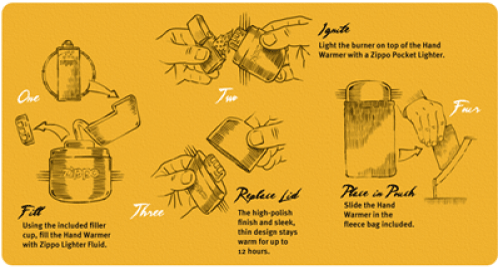 The Zippo Deluxe Hand Warmer is extremely easy to operate and can provide up to 12 hours of warmth from just one filling of Zippo Lighter Fluid. 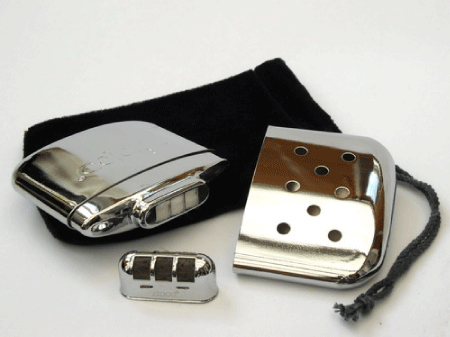 Basically, you should decide, in advance, how long you want to experience the warmth of the Zippo Hand Warmer, for once it is ignited, it cannot be shut off. After ignition, heat is provided by a catalytic process without a flame, so the only way that the hand warmer will extinguish, is when the fuel is finally used up. I was thrilled at how much heat the Zippo Hand Warmer put off. This little gadget was extremely easy to hold, fit perfectly in either my coat pocket or jeans pocket and kept my hands very warm and toasty. It's always been my experience that if I can keep my head, hands and feet warm, I can withstand any outdoor temperature. Now, with the Zippo Hand Warmer, I can effectively keep my fingers from getting numb and painfully cold when outside for extended periods of time. This hand warmer is extremely long lasting as well, for it can be successfully used at least 70-80 times before the burner head needs to be replaced. If you plan on spending any amount of time outdoors this winter, be it at a football game, ski trip, hunting or camping trip, then I highly recommend the Zippo Deluxe Hand Warmers. They are long lasting, easy to use and powerful enough to keep your fingers warm and toasty, no matter the weather conditions. Also, because this hand warmer is made by Zippo, you can rest assured that this winter essential will perform well season after season! Do you have any tips for staying comfortable and warm when the winter cold is at its worst? Disclosure: I received two Hand Warmers from Zippo in order to facilitate my review. No other compensation was received. This product review is based on my own personal experiences with this item and is completely honest and objective.